I have a 2014 F-150 and would like to change out the tailgate for a tailgate for my fifth wheel. I hate the hassel of having to lower or raise my tailgate everytime i want to hitch or unhitch. My OEM tailgate has a backup camera under the Ford logo. Are there any fiver tailgates out there that can accomadate the camera. I have looked at amazon, etrailer and a few others but the description never says anything about the camera. I would like a lockable tailgate. 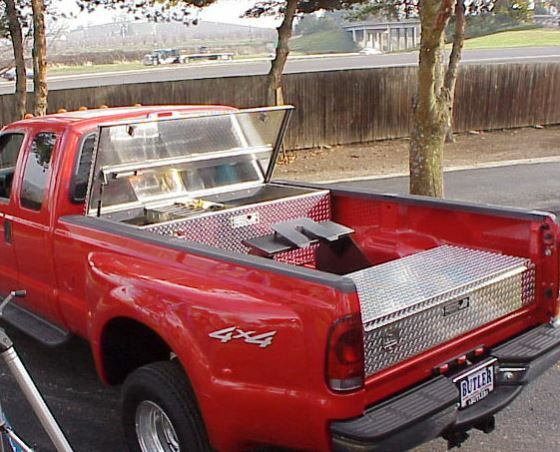 Often I still had to lower the 5th wheel tailgate for my previous truck. With my new truck I decided to just stay with the OEM tailgate and don't regret that decision. Lockable tailgates are certainly available. You might have to go to a license plate style backup camera versus the stock Ford camera system. Just don't assume a V-gate will let you hook up without dropping the tailgate. We got one because we bought a used truck with a damaged tailgate...first time we unhooked, the pin caught it and popped the tailgate off...luckily it was plastic and just flexed. This is after a long time with the standard tailgate and never having an issue. I loved the V tailgate we had on the 2001 Ram 2500, Custom Flow bought used for $100. It matched the Ram body lines, yes had to watch pin height before pulling away. Well now have a 2016 Ram 3500 DRW with BU camera and locking TG! I don't find it to be too much hassle to drop and raise TG during loading process. Now if Custom Flow would build a V tailgate with BU cam,era and compatible power lock I might be interested. X2... have not had anything blow out of the bed since I switched to a v slotted T gate. In my case, it was more than just the hassle of lowering the gate to hook up or disconnect. With the gate down, I'm mere inches away from the face of the trailer and could easily hit the trailer with the tailgate if I wasn't straight on. I just got my V gate this Winter. My first load and unload to bring the trailer home from storage was great. I actually need the V-gate, for reasons I won't repeat again. My truck is an antique so no tailgate camera for me. But it would be extremely easy to add a camera to a quality V-gate. You could even use the Ford logo style if you wanted.